TEDxDePaulUniversity will be returning on April 12. The fourth annual TEDx event will feature nine speakers who will give presentations on various topics centered around the theme “Fast Forward” at the School of Music’s Holtschneider Performance Center. 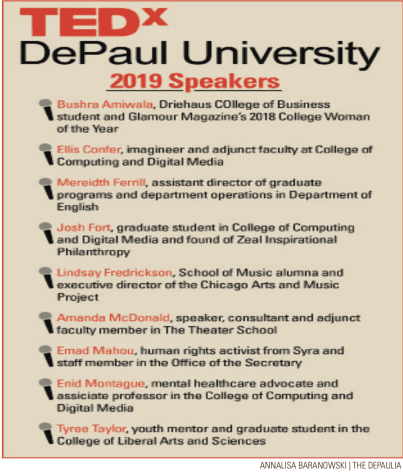 TEDxDePaulUniversity, according to its website, is independently organized through a license provided by TED, the idea-generating nonprofit organization. TEDx is a program of local, self-organized events that bring people together to share a TED-like experience. This event hosts faculty, staff, student and alumni to speak to the DePaul community. This spring, the speakers consist of three faculty members, three students, two staff members and one alumna. A record-breaking 139 speaker applications were submitted for this year’s event, a 22 percent increase from the previous year. In 2018, over 230 people attended the May event. People immersed themselves in new ideas through numerous interactive engagement activities including meditation, drawing, balloon art and music. Themes in previous years have been “What Must Be Done?” in 2016, “Courage to Connect” in 2017 and “Reimagine” in 2018. One of the speakers will be Bushra Amiwala, Glamour Magazine’s 2018 College Woman of the Year and a junior in the Driehaus College of Business. At the age of 19, the Chicago native became the youngest person and first Muslim woman to announce her candidacy for the Cook County Board of Commissioners to serve as a voice for both her generation and marginalized communities. “I think this past election cycle, with record-breaking candidates and ‘firsts’ elected in office, [it] shows we have fast forwarded to a new generation in politics,” Amiwala said. Despite coming up just short in the election, Amiwala’s campaign drew historical voter turnout and was covered nationally. Amiwala was also recently named Seventeen Magazine’s Voice of the Year. Ellis Confer, another one of the speakers in this year’s TEDx event, is an adjunct faculty member in the College of Computing and Digital Media. Coming from over a 30-year business background, Confer founded Outrageous Innovation Inc. in 1999 while he was a consulting manager at Andersen Consulting. He has provided advisory and solution design consulting services in different practice areas such as business and information technology strategy, project management and enterprise and security architecture. As an undergraduate at Purdue in the 1970s, Confer became a student activist. He joined forces with fellow activists to promote efforts with Purdue officials to create programs that enhanced educational opportunities for current and prospective black students. Josh Fort, founder of the non-profit Zeal Inspirational Philanthropy (ZIP) and a graduate student earning a master’s degree in computer science in the College of Computing and Digital Media, will be a TEDx speaker as well. After graduating from Wheaton College in 2016 with a bachelor’s degree in integrative philosophy communication, Fort spent two years at Brandtrust using applied social sciences to solve business challenges. Fort launched ZIP in 2014 after ideating about the organization as a teenager. ZIP is a multifaceted social enterprise and its mission is to equip everyday heroism. The preparation process for the speakers entails all of them meeting with a speaker coach toward the beginning of the process. They spend one hour discussing their goals and what they want the audience to take away from their talk. The speakers are also required to attend one in-person rehearsal with the organizing team, speaker coach and a coach who helps with stage presence. TEDxDePaulUniversity will take place on April 12 from 1:00-5:00 p.m. Registration is now open on TEDxDePaulUniversity.com and Eventbrite, where tickets are $15. DePaul students can buy tickets at a discounted price of $10 and will be required to show their student ID at check-in.